Light infestations of flies and other insect pests can be controlled with our range of solutions. For heavy infestations or critical applications, see our professional services for fly control. Automatic dispensing unit for use with Purge Fly Spray. 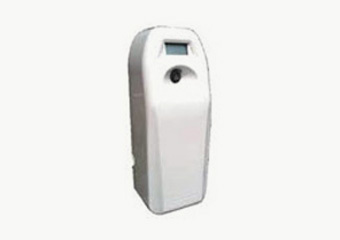 The Pulse Unit automatically sprays a fine mist of spray. The Pulse Unit can be programmed to sprays per hour, 12 or 24 hour. The Pulse Unit is battery operated. It can be wall mounted or free-standing. A non toxic fly killer. In a one-spray can, designed for use with the Pulse Dispenser. Purge can be used safely around the office, food preparation areas*, animal housing units. Packaged as a long lasting case of 12 cans. * Should there be some qualification here. Available in a range of sizes, from Industrial to compact. Electronic Fly Killers can be wall or ceiling mounted or free standing. Flies are attracted to the unit, and killed upon impact. A handy slide out tray enables easy cleaning. Spares and replacement bulbs can be supplied. Contact EcoPro for advice on suitable sizes for areas. 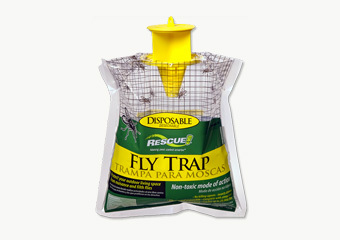 RESCUE!® Disposable Fly Trap. Natural Fly traps to catch and trap flies, killing them. Just add water and hang where appropriate. Flies are attracted to the trap, drawn by natural pheromones. Ordering Fly Control Products is easy with EcoPro. Call or email us with your order or to discuss your requirements.